If you read my Instagram post a few weeks ago, you know that I’ve been struggling a bit. I’m deep in a trial that I never saw coming (do we ever see them coming?). This trial has been one of the hardest I have ever faced, maybe the hardest I have ever faced. It has gotten me down, feeling like I’m destined to get knocked down again just when things start to feel ok again. Which, to a degree, is probably true. I’m never going to hit a time when things will then be perfect for the rest of my life. I’m always going to have struggles, big and small. Knowing that, has prompted me to try and take control of these feelings and use them, rather than let them use me. I don’t claim to have all the answers, and even knowing how to best cope with a trial doesn’t take away from that fact that you still have the trial. It doesn’t take away all of the pain and it doesn’t make it automatically better. However, what it does do is help you not get so stuck in the trial that you feel like you can’t endure it. It helps you feel like there is still good in the world and to see those moments of goodness. Self Care. 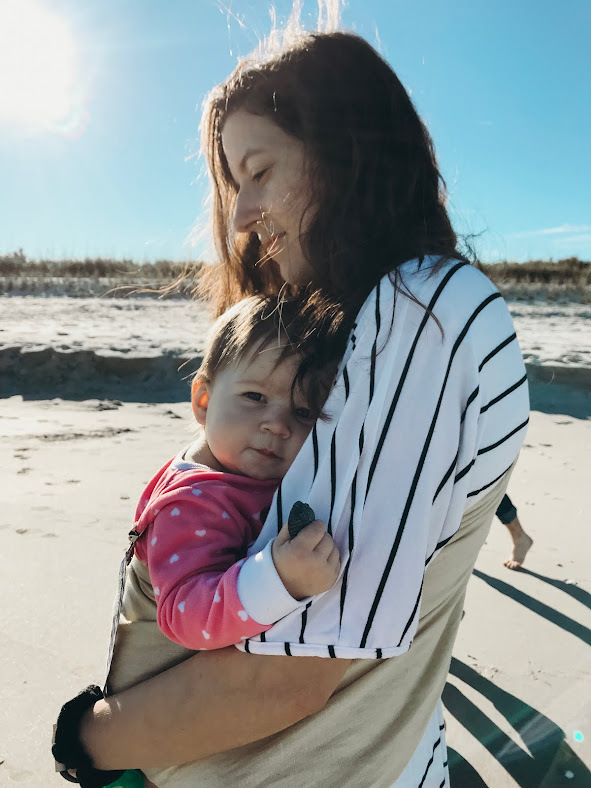 I feel like I’m personally always a big proponent of self-care (especially as a mother) and making it a priority, but when it comes to struggles, sometimes it seems like self-care is the last thing that you can worry about. For me, it’s important to take time for self-care so that I don’t sink even deeper into what I’m feeling. Right now, my self-care looks like a brain dump for 5 minutes every morning and every night. I give myself permission to write whatever comes to my mind (something that I have NEVER been able to fully do before) and then I shred the pages. I have a separate notebook for anything I want to keep from the brain dump and I transfer it there, but the rest gets shredded. It also looks like getting up earlier to take 10 minutes to read my scriptures, to do affirmations, to do 15 minutes of yoga, and to figure out how I want my day to go. Everly has also decided that she also needs to get up earlier, but I just let her play in her crib until I’m ready to get her. We’re both happier when I can be present with her and not stuck going over everything in my head constantly. Exercise. This is kind of self-care, but honestly, it’s more emotional than physical for me. It keeps me feeling healthy and it helps me feel grateful for my body, even when other things aren’t working out the way that I want them to. In addition to yoga, I take Everly on a walk every day. It gets us both out of the house and helps me breathe again. I’m not sure what it is about getting outside, but I always feel a little better and a little lighter when we get back to the house. I also plan on adding in strength training a few times a week. It’s something that I’ve wanted to get into since before I got pregnant with Everly, but something that I never actually got into. Prayer or Meditation. (or both :) ) Prayer is something that I have always struggled with. At least the formal, down on your knees, “thee”s and “thou”s kind of praying. It generally seems forced and the “rules” of it have always seemed arbitrary to me. I’ve tried so many different ways of praying, lately in the form of prayer journaling. However, what has worked best for me, is just giving myself permission to pray however I want. I tell myself that all I have to do is start with “Dear Heavenly Father” and end with “In the name of Jesus Christ, Amen.” The rest is entirely up to me. I give myself permission to pray while laying in bed, or sitting at the table. Sometimes it’s short. Sometimes I use “You” and “Me”. I let the rules go and just say what’s in my heart. Along with prayer, I’ve found that meditation really does a lot for me. If you’re new to meditation (which I still consider myself to be), then I recommend using a free trial of an app. I’ve used Calm before, and currently using Headspace. Both of which I have loved. If you’re a mother, then the matriarc app also has meditations in it that I’ve loved. Write it out. I was listening to the Find the Magic podcast the other day and they were talking about trials. They suggested that you write down 3 questions and the answers to them. What could be a possible positive outcome of this struggle? For me, this has really helped me to put my trials in perspective. 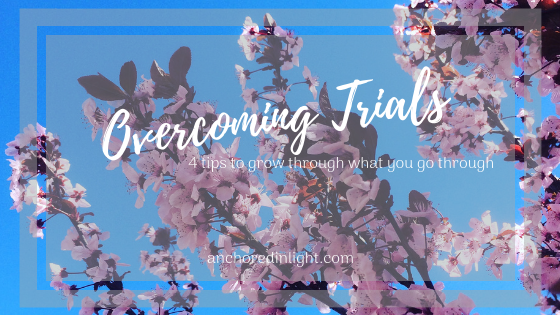 When I get really deep into feeling badly about what is happening I ask myself the same questions about past trials. What was my struggle? What were my fears? What was a positive outcome of that struggle? It helps me see that I got through those hard things before and came out better from them. It helps me see that this struggle is something that I can get through too. Trials are hard. I think that they’re meant to be. I often go back to what my mother said to me when I had a breast cancer scare a few years ago. She told me that she’d had her own scare years before and that she came to terms with it by turning it over to God. She said, “If this is what it takes for me to become who I need to be, then I’ll do it.” When I’m really scared or worried, I think of that. I think of the Rachael that I really want to be, the woman that I am meant to become. If this is what it takes for me to become her, then I’ll do it. What tips do you use to get through hard times?